Starting a new column on my blog called ‘Wine of the Day’ where I will talk about any wine that grabs my attention. It need not be the most expensive or well-known label. Just some wine which is exceptional or has a story waiting to be told. Erasmo Late Harvest Torontel is both. It is a lush, balanced, slightly aromatic sweet white wine that comes from a 60 year old dry farmed, low yield vineyard in Caliboro, in Chile’s Maule Valley, 155 miles south of Santiago. 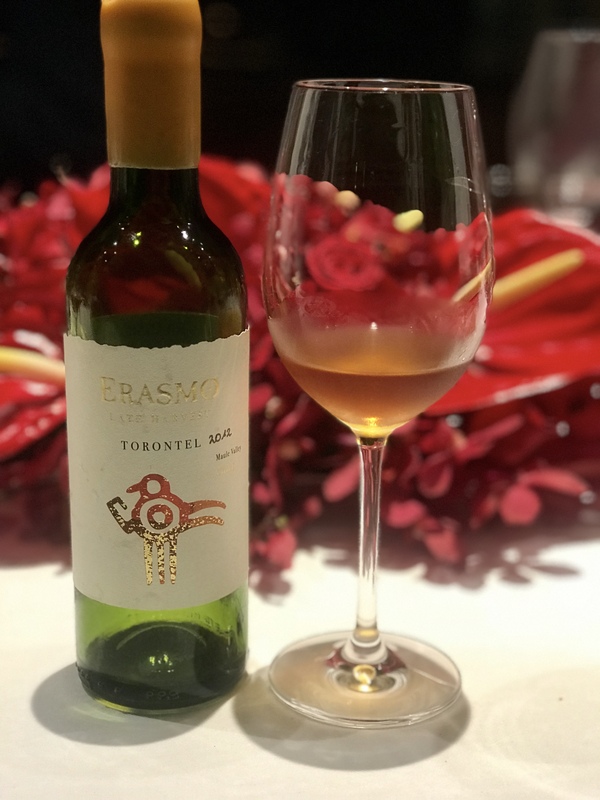 Erasmo Late Harvest Torontel has been scoring highly with both critics and consumers ever since its first vintage 2006 was released in May 2008, garnering rave reviews because of its consistently good quality. 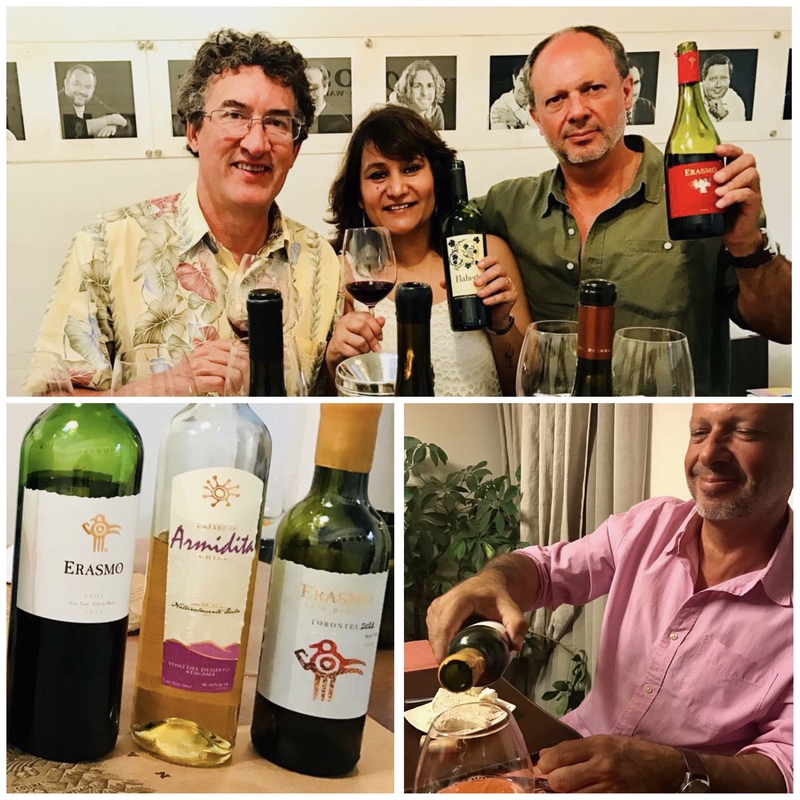 I was first introduced to this wine on my visit to Chile in March 2017, where I tried the 2011 vintage with Andres Solar of Erasmo, who had brought a bottle along at the tasting organised for me by ProChile with MOVI Chile producers (Movimiento de Viñateros Independientes) at Bocanariz Wine Bar in Barrio Lastarria Santiago. A little bit about the grape varietal before we come to the story of how it was this wine was conceived. Torontel (Moscatel Amarillo), a cross between Muscat of Alexandria and Criolla, is a common white grape cultivated in Chile and also used in the production of Pisco. Not to be confused with the Argentinian Torrontés, though they both are from the same family. And completely different from Torrontés (Albillo) grape from Galicia in Spain. Torontel first arrived in South America at the beginning of the colonization period. Known for its expressive aromas of lime, orange blossom, verbena and its spicy, citrus, honey flavors, it never became a favorite of grape growers as it fetched a low price and made rather simple wine. This varietal caught the eye of Count Francesco Marone Cinzano, well known in Tuscany for the famous Col d’Orcia estate in Montalcino, who in 1995 founded Erasmo, an organic winery and vineyard in Reserva de Caliboro. 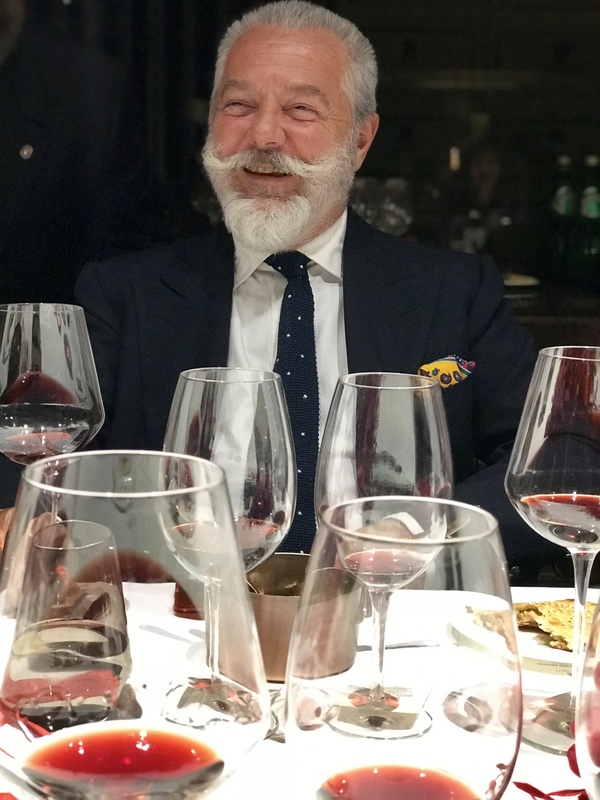 Count Francesco Marone Cinzano at the Col d’Orcia & Erasmo Wine Dinner organized by Ace Beveragez Pvt Ltd at Roseate House Aerocity in New Delhi recently. Count Cinzano is one of the founding members of MOVI Chile. In a scene reminiscent of the movie Sideways, while driving along a dusty country road in Maule Valley with his consultant oenologist Maurizio Castelli, in the autumn of 2006, Count Cinzano and his friend saw this beautiful gold-colored grape growing in a vineyard. On finding that it tasted like honey, they decided to do something special with it. Thus was born Erasmo Late Harvest Torontel in the sweet style of Italian ‘vino de messa’, communion or sacramental wine offered at the church altar. With notes of ripe apricot, pear, citrus, candied orange peel, honey and whiffs of rose petals, it has a good balance between sugar and acidity. To make this wine, the grapes are left slightly longer on the vine to ripen, till the skins begins to wrinkle, while they still retain their natural acidity. Whole bunches are then plucked and kept hanging in a room till they reach the desired level of dehydration and concentration, after which de-stemming is done by hand and the grapes put in French oak barrels for fermentation. Bottling takes place after a year and thus is born what Count Cinzano refers to as “nectar of the gods”. Despite the fact this venture is not economically viable, as the production process is long and laborious, according to Francesco Cinzano it represents the “renaissance of the Torontel grape” and of Maule Valley, the historical and traditional wine producing region of Chile. It an “expression of love towards mother earth”. With Movi Chile producers Ed Flaherty and Andres Solar of Erasmo at Bocanariz Wine Bar, Santiago Chile. ‹ Diya-Simply INdiya at The Leela Ambience Gurugram impresses with its makeover and a brand new menu.